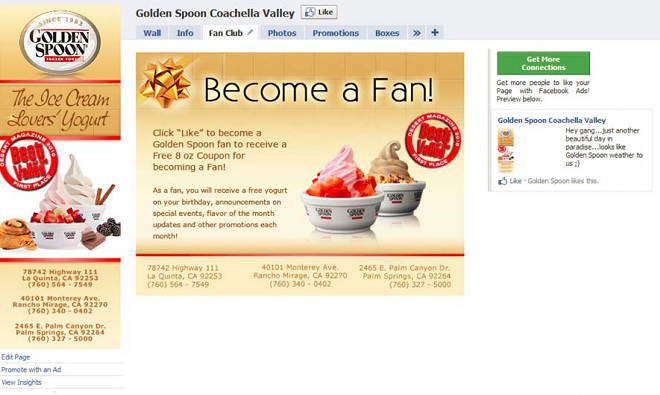 In January, Golden Spoon ran a Facebook ad campaign. Golden Spoon owns and operates three stores in Coachella Valley, Calif. The ad was designed to drive traffic to the company’s Facebook fan page with the call to action being “Like” this page (see illustration below). Fans were also asked to complete a registration form to join Golden Spoon’s e-mail list. DigitalEye wanted to improve the Facebook ad buy targeting efficiency for Golden Spoon by using InfiniGraph’s Social Intelligence analysis to improve social targeting based on what consumers are connected to and most active around (brand affinity). 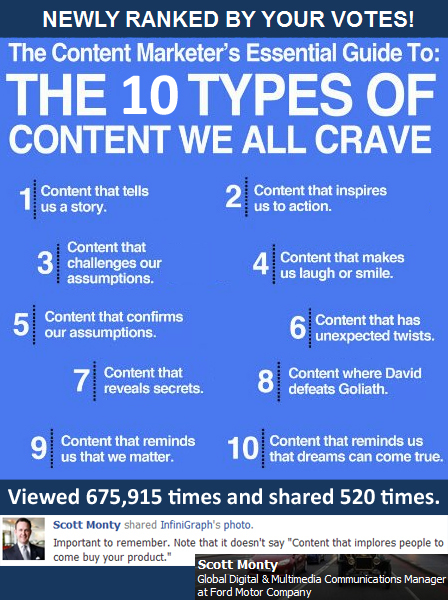 Discovery – Find brand affinities that are most relevant to the target audience. Activation – Use trending brand affinities to increase targeting, clicktrough rates, “Likes” and improve purchase conversion. Tasks included running a Social Intelligence analysis on Golden Spoon’s Facebook page and Twitter profile to obtain brand affinities, which were applied to the Facebook ad buy. The prospect list was further refined using InfiniGraph’s Social Intelligence Brand Affinities feature, which taps into like-minded groups on Facebook, based on relevancy and activity. The geographic target was Palm Springs and a 50-mile radius, while the demographic target focused on people ages 14 and up, women, as well as families (see illustration above). 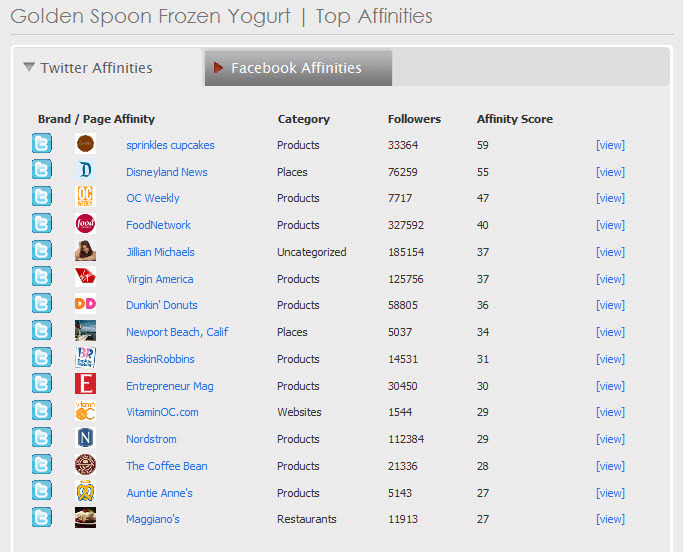 Shown below is Golden Spoon’s “Affinity Map,” which shows how their target audience interacts with other brands. 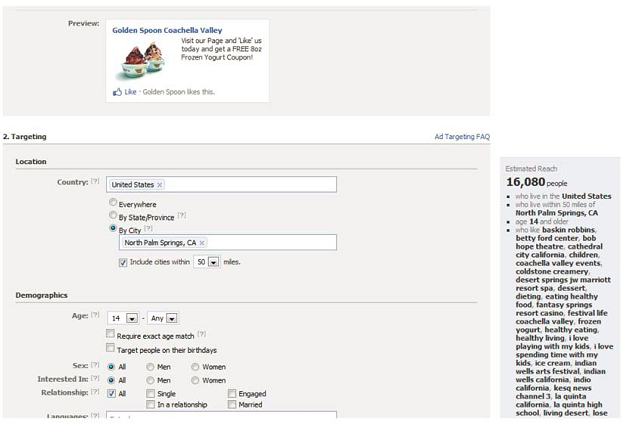 The Affinity Map was used to directly specify the company’s Facebook ad buy in the “follow by like” and interest area. DigitalEye used InfiniGraph’s control panel to gain additional social intelligence and to determine what brands were trending most. Social Intelligence also aided in increasing clickthrough rate and reaching the most active consumer base. Same store sales: up 13.7% during promotional period. * Coupon redemption rate was reported to be approximately 18% with each e-mail promotion. 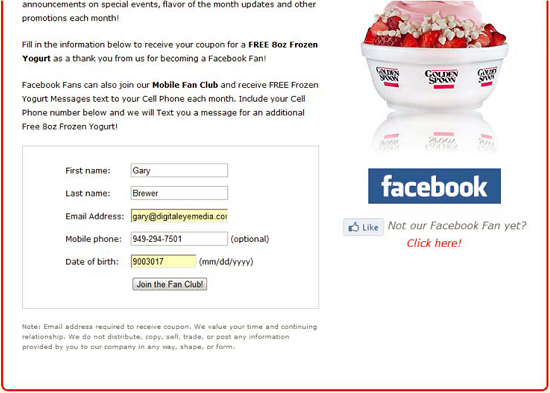 Golden Spoon’s Facebook fan page and sign-up form.